"I saw the pain on his face," he told reporters in the Holy See Press Office after the meeting, referring to the issue of child abuse by members of the Church in Ireland. The world director of Scholas, José María del Corral, gave a brief introduction in which he highlighted some aspects of the audience between the Pope and the singer. Bono shared the story of his debut in the world of music, which was not , he said, without difficulties and obstacles. Paul David Hewson defined his meeting with the Holy Father as a "lightning strike", and he spoke of a natural and fluid dialogue that touched on issues of great relevance, such as the education of young people, especially girls, who in different countries of the world suffer marginalization and exclusion. The singer gave his support to Scholas, and its "innovative projects", in the great mission of generating an "educational revolution" that helps young people to discover the meaning of life. During the meeting with the Pope of the care of the common house and of the encyclical "Laudato si '" was also discussed. 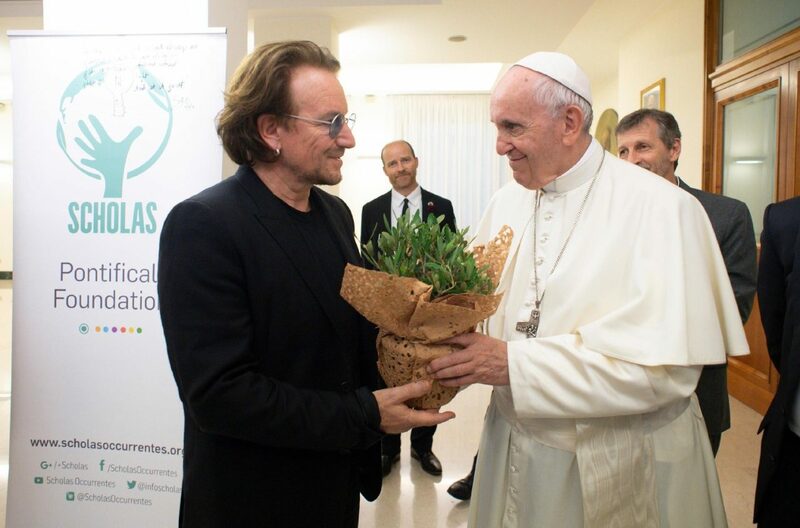 "Pope Francis is an extraordinary man for these extraordinary times", said Bono before leaving the Vatican Press Office.